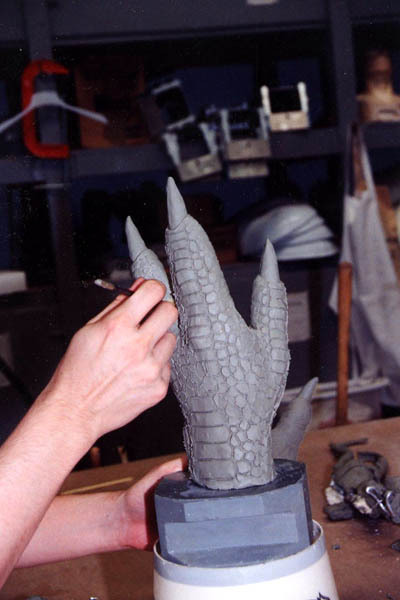 MEL was charged with building both the most and least prominent creatures seen in the film: the Goombas and the Allosaurus rats. In doing so, they helped helped bring to life the world in which they inhabited. No one can deny the sheer energy brought to the picture by the mere presence of the Goombas. Likewise, the Allosaurus rats dirty it up a little as lighthearted pests. Steven Applebaum: How are you two? Allan Apone: We’re great. We’re doing good. How about you? SA: I’m good. It’s been awhile since I went down there. Paul Elliot: So what do you want to ask us? SA: Well, let me first introduce my partner, Ryan Hoss. PE: Hey, how are ya? RH: Hey, I’m good. Good to talk to you guys. SA: Yeah, Ryan lives in Tennessee so he couldn’t make the trip with me. SA: Well, I guess you can begin Ryan and focus on the production angle. You know where to start with that. RH: Okay. Well, first of all, I want to thank you guys again for talking to us. This is really great. I wish I could have got to see all the cool stuff Steven did. The first thing that would be great to hear is how you guys at MEL got the job to do the Goombas and the other things you did for the film. So we came back to our shop and we sat down and said “Well, that’s really silly that they can’t see we can do the dinosaur even if we hadn’t done [one before].” So we said “Let’s do one right now. We’ll just do a quick one in clay.” We had Patrick’s pictures of what the Goombas looked like--the lizard guys--and we sculpted one in about an hour-and-a-half, I think it was. Just a quick sculpture of the lizard head. We then put it on a mannequin and dressed it kind of the same way that Patrick had drawn the character. We had a bunch of old stuff [in our costume department, which we used to dress it]. It was kind of military-esque. So we dressed it, put it together, shot it and [as this] was before digital photography we took it down to the one hour, had it processed, and then messengered to the producers by midday. Like something out of Terminator. AA: After they--(laughs)--got the picture they called us up and said “Oh my God, you guys did that just now?” and we said “We just made this just now. This is what you’re looking for,” and they said “This is absolutely what we want and we’re amazed that you were able to do it so fast,” and so they gave us the job. That’s how we got it. RH: Great. So this prototype is the one that looks almost like something out of Terminator. RH: That’s really interesting. I didn’t notice that the costuming in particular just came from things you had. AA: That was just for what we did. The costumes they actually wore were designed by Joseph Porro, the costume designer. RH: Great. And this was just a sculpt? It had no animatronics and none of that kind of thing just yet, right? AA: Yeah. We just did a sculpt from Patrick’s character design, because he was doing the creature designs. "Oh my God, you guys did that just now?" RH: So, from that point, once you guys got the job, where did you go from there? AA: Well, we started building the Goombas. They were basically background characters at first. They were gonna be used within the scenes mostly as background characters, but they’d be prominent--no dialogue, obviously--but not really featured. When we created them we decided to do some extra stuff. We made the heads a lot more animatronic and movable then they had even thought to be possible and the way that we did it we made a better product then they had hoped for. So when they actually saw them work they actually rewrote the script so that characters like Hark, the Goomba, became much more pivotal in the script and there was more action given to the Goombas within the movie because they were all self-contained. We did some RC mechanics for eye-movement and for lips and eyebrows, things like that, so it was the puppeteer inside the suit and one operator outside the suit to give them the full movement. RH: You mentioned the "Hark" character. Now, from what we’ve been able to tell there’s a really interesting process of how that character shifted into a much larger role. Originally, the character was named Hark and he looked--both in your early sculpts and the concept art--very different from how he does in the final film. Additionally, Hark went from being a separate character to being the de-evolved version of Toad. Could you talk a little bit about how that came about and what you guys had to do to consolidate the characters? 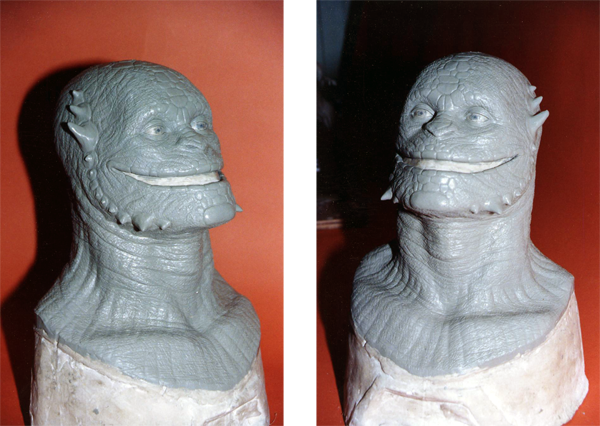 SA: Well, in some of the photos of Hark’s original sculpt you can see that he originally had more pronounced spikes along his chin and temples that aren’t seen on Toad in the movie. Do you remember why they were made smaller? AA: I think to make him “softer,” because he became such a sympathetic character and it might be, too, because there were about seven different Goomba heads that were made. Seven different sculptures utilized at different points for different things, but the Hark character was definitely the one they decided they wanted him to be “softer” and more sympathetic. There are ones with the spikes on them, but it’s not the Hark character. SA: Well, we were surprised to see those early traits for a Goomba because people are disappointed that you don’t see so a great deal of variety among the Goombas other than their skin, which had an amazing number of styles. Other than that they really don’t look very different among each other. AA: Actually, a lot of them are very, very different. The paint-jobs are very different. In a lot of the lighting you don’t pick it up because of the way it’s lit. I think we had 11 suits and each of them was a separate, distinct head of the animatronic suits. Then we had a bunch of different stunt-suits for the stunt guys that didn’t have any animatronics that were just used for doing stunts and things like that. There were 11 separate heads with different paintings. There were seven different sculptures, but every one that we made--of which I think there was a total of 11, maybe 18--they all had a different paint-job. RH: The one thing that I thought was really interesting was that some of the Goombas seemed to have different functionality. So, for Toad in particular, was that animatronic more functional than some of the other Goombas so it could have better close-ups or more range of movement for the head or the facial features? AA: No, all the mechanical Goombas were exactly the same. They could all do everything. RH: Okay. I guess in the film you have three different kinds of Goomba “species,” right? I’m not sure if you guys had any official names for them, but there’s the round “ape-head,” which was kind of the “standard” one, the lizard-like “Allosaurus-head” and then finally the snake-head. Were there any challenges in trying to make those three separate ones distinct in and of themselves? AA: No. 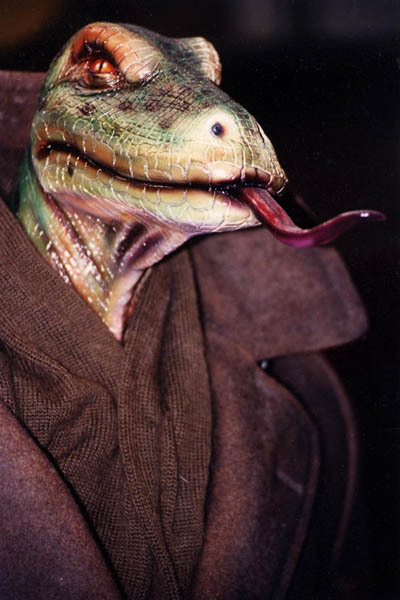 Like I said, the only distinction that we made for those were [that] the snake-head and the lizard-head, as I called them, had tongues that we liked, but the directors didn’t really want to see them that much. I think you only see it once in the movie, but it was pretty cool just having the tongue sort of come out a little bit and that was all done pneumatically. Outside of that there was nothing really difficult about creating the distinctions. The distinctions were sort of laid-out by production that they wanted different types, but they seemed to stay with the lizard-head and the “Hark-” type head predominately. RH: And I guess you kind of see that. The fans’ reasoning for the differences is that the rounded-head Goombas are, to us at least, the closest to their namesake from the game while the lizard-head type is closer to the Koopa Troopas. But beyond those three types of Goombas, were any other types considered that didn’t just get made? AA: No, not that we had or even had pictures of. They were all pretty much just those three types we were given to go off of. I think early, early on there might have been. I remember hearing talk about that, but I couldn’t verify it for you. RH: Okay. Oh, I also did want to mention something since you brought up that the directors didn’t really like the hissing tongue too much. You’re right, you do see it only once in the film, but we have footage of a cut scene where one of the Brooklyn Girls interacts with a lizard-head Goomba and says that “He’s not as bad as her boss,” or something like that, and she asks the Goomba if it wants a cigarette and he hisses at her. AA: Yeah. (laughs) There’s a whole bunch of cut footage. They shot a bunch of stuff that’s not there. RH: Yeah. Is there anything in particular that you guys thought was great that didn’t make the cut? AA: Well, there’s a lot of stuff with Goombas sliding down that tube. There’s a bunch of really fun, comical stuff that was there and there’s a lot more to the elevator scene with Luigi and Mario when the Goombas dance in the elevator. It was pretty funny. RH: We heard that that elevator scene was actually not in the script and it was kind of improvised on set and kind of developed that way. Is that true? AA: I think a lot of the movie was improvised. AA: (laughs) There was stuff thrown at us everyday. So, yeah, it wasn’t in the original shooting script that we had when we started. And from that we built all the little Allosauruses. The little rats. They asked us if we could do that, so we built all of those. How many of those did we have? AA: Yeah. Four Allosauruses that we built. SA: Before we contacted you guys we did interview Guy Himber who I believe built the mechanical innards of the rats. That was a pretty good insight into their development. AA: Yeah. Guy was working for us on that. We brought Guy in to run the mechanics on that. SA: Unlike the Goombas, the Allosaurus Rats remained largely background characters and only appeared three times in the final film. What were the production's expectations with them compared to MEL's? AA: After production saw what we could do with the Goombas they asked us to create the Allosaurus'. They had a very high expectation and we knew it. I think we exceeded theirs as we made 6 different "Dino Rats": The fighting duo, 3 general garbage pickers and a runner. The latter was built from mid-body up on an RC car and would scurry away. SA: One thing that I was going to say earlier is that the Goombas seemed to be somewhat more intelligent and represent more of a threat in the earlier scripts. Do you recall if anything with the Goombas was cut for being too “mature” for the tone they eventually decided for the film. AA: Well, there was actually a lot of stuff where they were a threat. They were firing their weapons, they were chasing down Mario and Luigi. There’s a whole bunch of stuff where they were very threatening but, like you say, as it got into the editing room they changed a lot of the feeling of how they wanted the film to look. SA: They kind of ruined the true potential of the Goombas through the editing. We have a document from Parker Bennett, one of the original writers, that indicates that the producers were even flirting with the idea of giving the Goombas subtitles and having them talk amongst themselves during the action. AA: Yeah, we never did anything except for with Hark [and] trying to get him having speech, but none of the other Goombas. There was stuff that they talked about where they were going to do-- I had heard talk about subtitles, but it was sort of a mental telepathy type of thing in the elevator. It was going to be something like that, but I never really heard anything other than that. "We should really get overtime for this." AA: Yeah. That would have been… I don’t know. I would have had to see how that would have played out, but, for us, just being there and working on the film was just fantastic. We had a great time on it. RH: Now, in terms of the internal workings of the Goombas and the costuming: did you guys have to collaborate with Joseph Porro to make sure that those costume ideas worked around the internal structure of both the actor and the animatronics and everything that goes into the one full, complete Goomba? PE: Yeah. 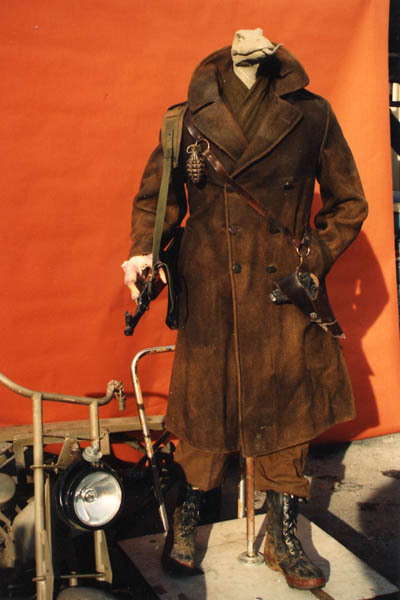 Basically, we designed the whole rig based on carrying that size jacket and the overall dimension [was based] off the original costuming design. We made the rest of it fit. SA: There’s actually one thing about the costume design that neither Ryan nor myself like, which is the black rubber gloves. When we received the development photos from you guys we discovered that the Goombas actually had these giant, three-pronged dinosaur hands that aren’t even seen in the movie because they’re covered with these black rubber gloves. What was it like making those detailed hands only to have them covered up most of the time? AA: It’s business as usual. We actually started making them, but it became a budget item. They didn’t want to make a bunch of hands and have to deal with them. We would have made them in foam-latex and given everything that [the Goombas] had to do we would have had to make duplicates and just because foam-latex wouldn’t last through all the wear-and-tear production just thought it would be less expensive if they just wore black gloves and they didn’t have to worry about it. SA: Right. Did you want to do anything further with the Goombas, such as giving them long reptilian tails that were also cut because of budgetary concerns? AA: No, because in the designs we were given they didn’t have tails and if they did have tails they would have been cut because of budgetary reasons. All the money went into the face to give it movement. RH: Back on the hands for a second, you do see them in the film for half of a second. It’s almost a mistake because the second time the hands are shown they have the gloves on. This is in the de-evolution scene where Toad gets de-evolved into his Goomba form. Do you remember if that was the only scene where you tried the hands or were there other scenes or after that did they cut them? AA: I don’t remember. I honestly don’t remember ever using them anywhere else. RH: Do you recall which scene the Goombas were first shot in? As their reptilian hands are first visible in the de-evolution scene it seems like it was then. AA: I believe our first scene was marching down a corridor with Dennis Hopper. RH: Oh, and another thing--that whole de-evolution chamber sequence with Toad de-evolving is probably one of the most “shrouded in mystery” kind of scenes in the film because it seems like they changed it many times. It varied from script-to-script and we have lots of alternative footage. One of the behind-the-scenes videos we have shows an effects shot of a Goomba head basically exploding into goo like it’s being de-evolved. Do you guys remember anything about that? AA: They shot things because they wanted to show different times that they used the de-evolution chamber and stuff and they wanted to show failures of [people] going too far and getting into the ooze [stage] and that type of stuff. They did a few different things like that. We shot a bunch of stuff in the de-evolution chamber that also just didn’t include Goombas or [people] going half-Goomba [and then] into the ooze or going into other things that they had planned. I never saw what they were, but they were just to show that it did more than just turn them into Goombas. RH: Okay. You guys talked a little bit about the Allosaurus rats that you guys did. Ultimately, you guys did all the Goombas and all the Allosaurus rats, but there was also Yoshi and Koopa at the end when he transforms into the T-Rex. Were you guys approached to do any of those things? AA: No, those were already handed out by the time we got involved. SA: How do you feel those two examples compare to your work? How would you have approached them differently if you had done them? AA: You know what, I think those guys did a great job with the work they did. I don’t know that I would have changed anything. I think I probably would have done it the exact same way. I think they did a really nice job. RH: One thing that I really liked was how even though three different companies--MEL included--did the creatures in the film they all look like they’re from that same kind of world since all three of you worked off of the same Patrick Tatopoulos concepts. They really gel together. You can see they all came from the same place and I think that’s wonderful how that turned out. AA: Yeah. I think that all of us are very happy with that. They all had the uniformity to them that worked. You just got to chalk that up to Patrick’s designs. I think Patrick’s strong point is in design. SA: So you guys also did the dancer and police costumes. What was that like? AA: That was fun. We did a lot of different stuff for Joe. 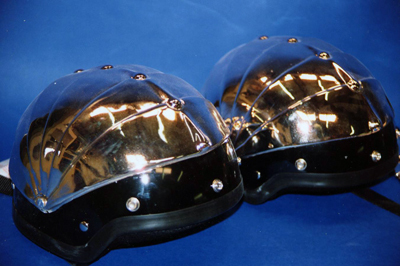 We did all the chrome helmets and ties [for the police uniforms] and we did a bunch of different spike-sheets that he then fabricated into other costumes. We did a lot of different costume pieces and elements as well as--I think--some props effects, but I can’t remember what those were. There was sort of last-minute detail stuff that people had brought to us, so our contribution in that film was pretty big. RH: Yeah. You can see MEL stuff all over the film. Once you know what you guys did it’s really great to see the level of variety in the film as far as the costumes, actors, Goombas and the Rats. But, obviously for the Goombas in particular, there had to be a lot of departments working well together to make them work in the film. How did you interact with the directors to both get what you wanted out of your animatronics and for the directors to get what they wanted out of the characters? AA: Well, basically it was like this: we had the design drawings. 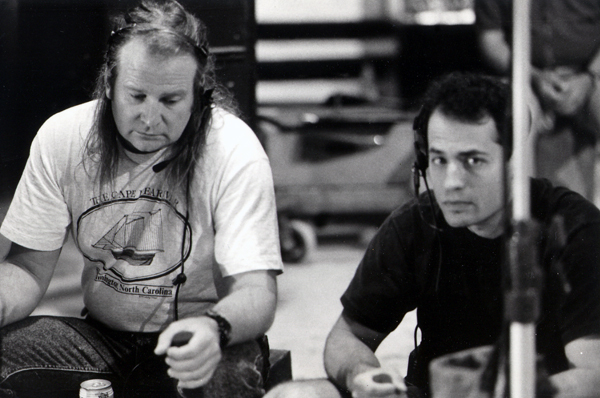 We then sat down with the directors to find out exactly what they wanted them to do. All they wanted them to do was be able to do turn their head and use one hand and the other hand was to be stationary in their pocket or on something like a gun or whatever. That’s what we chose to do. We chose to do that. So, as we looked at it we then decided to do a little bit more and actually create more animatronics to them so they’d get more out of them and they wanted us to cable them. We didn’t want to cable them, so we decided to make them radio-controlled. We didn’t want to have any cables coming out. We wanted them to be able to go wherever they wanted to go and for them to be able to shoot 360 [degrees], which was the only difficulty with the Yoshi character. You had this huge pipe coming out [Yoshi’s] tail and running all the cables and stuff they had to green-screen out with all the operators. We didn’t want to have any of that. We wanted them all self-contained. So, we did that and once we addressed what we had to address, as Paul was saying, our biggest influence from any outside source was the jacket. They wanted these characters 7’ 5”, so from the top of their head to the floor they’re 7’ 5”. The jacket that they wore was over a 100 lbs of wool. I mean it’s a freakin’ wool jacket. So, it’s really, really heavy and it’s really hot so we built a cooling system for the operator inside. We built a shroud for the shoulders that would drape the coat over the character so it acted like a screen so it never interfered with any of the mechanics because all the mechanics were well-hidden and away from any outside source. Russ Shinkle and Paul Elliot were responsible for that. So, when they saw a working model that we’d built they were totally blown away that it could do everything that it did and not be encumbered by cable. 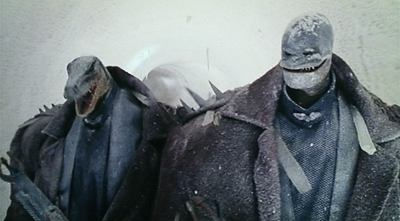 That they could walk through walking scenes with them and have full movement. RH: Right. So did they always want the Goombas to be 7-and-a-half-feet tall from the start or was that the result of having to get a tall guy to support all the rigging? AA: To create the rig we had to create a rig and everybody in the suit pretty much had to be a certain height so that it worked because we had limited adjustment as far as height went. I was probably the smallest Goomba. SA: How tall were you? AA: I’m still 5’ 9” and ¾ so add another 14 or 12 inches to that. I’m almost there, but I’m not quite. But everybody else in the suit was at least six-foot-tall. No, at least 6’ 1”. RH: Although the Goombas have small heads in the film, certain promotional items depicted them as being slightly larger. Were the heads always planned to be that size or were larger heads experimented with? We’ve heard the equipment made the suits top-heavy so perhaps that may have contributed to their size. AA: The Goomba heads were always this size. We never experimented with altering them. It was always the design plan. SA: Yeah, we’ve been able to speak with a couple of the Goomba actors. Michael Harding and Scott Mactavish. AA: Yeah. How they doing? SA: They’re both doing well. Mike is still acting. I think he’s on The Young and the Restless right now in a recurring role as “Dr. Dan Ananda.” And Scott Mactavish is a filmmaker. He directs and produces. They’re unfortunately the only two we’ve been able to get in contact with him. We know that Tom Merdis has passed away and the rest we just haven’t been able to locate. AA: Well, John Fifer who was our third partner at the time, retired in Ohio. AA: And he played Hark. SA: So, what was your interaction with the different actors? 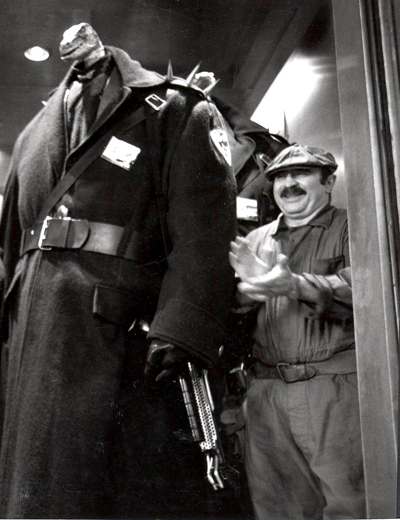 We have a few quotes from Bob Hoskins where he indicates that the cast ended-up acknowledging the Goombas as actual characters and would speak to them at face-level rather than chest-level where the operator was. PE: If you were a principle or you had to interact with them they treated you like you were part of the cast. In fact, a lot of times when we weren’t in scenes--we had our own little room that we did all our repair/maintenance and stuff like that--and the actors would come in and just talk to us a lot of times and just hang out. We got along with all of them really, really well. SA: On that note, both Mike and Scott have told us how well they were treated as Goomba actors. They already gave their own reason why, but can you speak on why you pushed for such good treatment for them? AA: Because what we did was very hard. When you have to wear a suit like that and perform it’s very difficult. It’s very taxing. We knew everything that was involved in it because I used to wear suits a lot. John Fifer used to wear suits a lot and we knew what kind of grueling situation we were up against and so we just knew the things everybody needed to have be able to perform well and just for your own… It’s sort of like being an athlete. You have those things that get you prepared for the next thing. That’s why we had a full-time masseuse or masseur, depending, in our room that took care of the performers and why we built the suits with cooling units in them and why we made sure production gave us every benefit to keep us performing at a high level. "We got along with all of [the actors] really, really well." RH: Cool. And about that, we’ve heard obviously a lot about just how hot it was inside the cement factory and you take that combined with how hot and heavy the coats and suits were for the Goombas, was it a challenge keeping the actors and everything cooled down enough to perform? AA: Oh yeah, totally. I mean, we would have to use supplemental fans and things like that. We had a full team that, if you weren’t in the suit and you were either a puppeteer or whatever in-between shots, all our focus, all the Goomba team focus, was keeping the people in the suits cool. RH: Right. One thing I wanted to bring up is that Frank Welker did all the creature voices in the film. He did Yoshi and he also did the Goombas. What did you guys think of the kind of voices that he gave all the individual characters? PE: I thought they were pretty cool. I really liked them. I thought he did a good job. Good choices. RH: Another little thing I want to get into is that, beyond the film itself, you guys did some trade shows and things like that and also a couple of toy commercials that the Goombas were featured in. PE: Also, we did almost a two-month trip to Japan on a promotional tour with Bob and John Leguizamo and Samantha and we had them at the Giants baseball stadium performing and stuff like that and it was a lot of fun. RH: Oh great. So, was that good to promote the film? Is that what those tours were for, to allow people to interact with the Goomba characters? PE: That was it exactly. John would have a field-day in the suit just surprising people. He’d be standing there at a convention and not moving and then all of a sudden he’d start moving and running after people. He’d have lot of fun with them. RH: (laughs) Now, when doing an in-person thing like that what kind of voice does the performer use? Would he just grunt in the suit or not say anything and keep smiling? PE: We modified the Hark suit. It had a microphone on the inside so that John could talk into it. He would just use his regular voice. RH: That’s great. We’ve also seen some behind-the-scenes footage of some of the Goomba actors just talking with their real voices while making the Goomba heads talk too. That was kind of funny. SA: What were your impressions of the film once it was released? Were you satisfied with your work? AA: I thought the film was lacking, not what it could have been. We started not having a solid script to work from and I think that's what hurt it. As for our work, we achieved everything and more that we set out to do. We exceeded [the] production’s expectations and had one of our characters turned into one of the main characters. We were very happy with our contribution. SA: We’ve heard rumors that if a sequel had been MEL would have returned to do additional work. Scott Mactavish in particular stated that he was asked by MEL if he would be available for such a sequel, but that the rumors might have just been "water cooler talk." Is there any validity to these rumors? AA: There were talks about it during the publicity stage of the film but when the film didn't do as well as they wanted we never heard anything more about it. SA: If a sequel had been made and the Goombas were featured again what would you guys have done differently? Would you have wanted to improve on anything or introduce more diversity/types? AA: Oh yes, we had planned on making the Goombas even more expressive and the suits would be more comfortable for the performers. SA: On that note, if MEL were to build the Goombas now using modern techniques and technology how might they be built differently? AA: There are more lightweight and state-of\the-art equipment that we can use. More use of computer-controlled electronics. 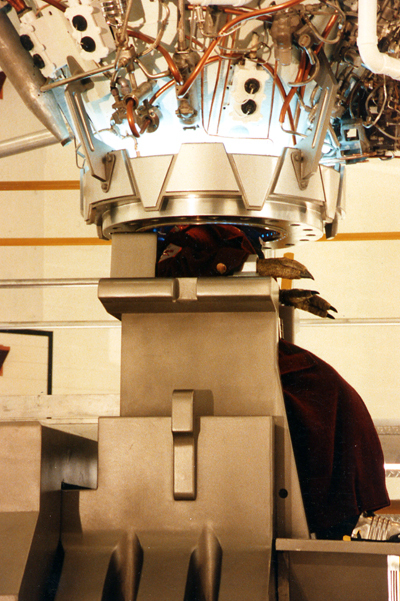 A much better cooling system and weight distribution of the costume for the puppeteers. I was one of them so I know how much that would be appreciated. The coats would be made out of a lighter material as well. They weighed about 20 lbs on their own. SA: Several members of our site are interested in building fully-functional replicas of the Goomba suits. Could either of you offer any advice on how to do so for these die-hard hobbyists? AA: It's a bit involved to go into here, [so] contact us at MEL if you are interested and we can give you some advice. It's no small task. PE: Okay, well guys, we've got to go. AA: Thank you very much. We really appreciate it. RH: Yeah, we appreciate you guys. Thanks a lot. SA: Good talking to you again. AA & PE: Okay. Bye.